A popular photo destination in Millgrove has been forced to close to the public after tourists caused chaos on area roads. Bogle Seeds on Safari Road is known for its massive blooming field of sunflowers that began in 1969, and has become a stop for those seeking photographs for social media. "For the first eight days we invited the public in, everything was wonderful. Everybody was happy. We were happy. Things were great,” said farm owner Barry Bogle. However, after a chaotic weekend, the farm says it will be closed for the rest of the year. "People were coming from every corner of our farm. And just inundating our farm properties, so we had no control whatsoever," said Bogle. On their webpage Bogle Seeds said on Saturday there was heavy traffic on area roads and Hamilton Police had to step in to shut the roads down. "We basically had a flash mob, only with cars. With over 7,000 cars on Highway 6, completely stopping it for four kilometres,” said Bogle. The farm says for the rest of the season patrons will no longer be allowed to view or photograph the over 15 rows of flowers. 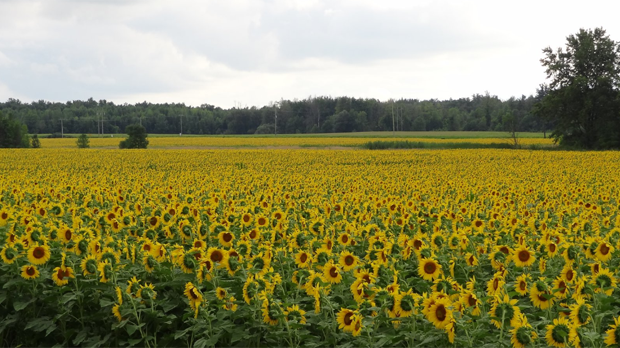 "There were quite a few sunflowers that I saw that were damaged, that were broken and lying down on the ground," said Jill Gowland who visited the farm over the weekend. The farm has since posted signs throughout the property warning people to stay away, but it hasn’t been working as selfie-takers are still making their way into the fields. "This isn't what we're use to in quiet country living. We just can't understand people trespassing. We would never do it on their property," said Bogle. Bogle Seeds also sells bird seed and other products and will remain open to customers wishing to make a purchase.